Moses Kim says that while many investors recognize bull markets, they often make the mistake of jumping ship way too early. Although investors were very bearish on gold in past decades when confidence was high in paper money and in leaders like Alan Greenspan, the change in confidence could fuel a bull market for gold. See the following post from Expected Returns. Most people do not have what it takes to crush markets. They complain that the stock market is rigged and that it is a form of gambling. This is mildly amusing to me since the very people who complain that stocks are a form of gambling are the same people who don't read annual reports; don't do their due diligence; know nothing about accounting; and get their investment advice from CNBC. But alas, I digress. I personally had no one to hold my hand and teach me how to invest. I was therefore able to objectively decide which investment approach was the best. I had my phase when I was positive technical analysis was the Holy Grail of investing. Then I realized that market makers know exactly what trend lines you are looking at and that they can easily break trend lines and prompt the herdlike reactions they seek from investors. Technical analysis works- until it doesn't. I always know who the real investors are who do their due diligence and who the armchair investors are. The armchair investor will inundate you with stories about how they made 200% on XYZ stock. This very well may be true. The only thing is, they'll conveniently ignore the huge losses they accrued by speculating on other high volatility stocks. Eventually, the speculative approach will end in tears. It always does. Bull markets in any given asset are driven by fundamentals. They usually follow periods of intense hatred for said asset. 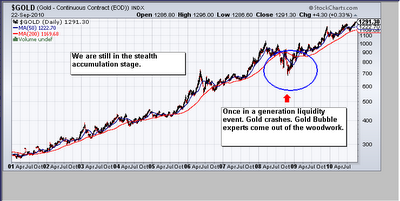 For example, gold was just about the most hated asset on planet earth for about 2 decades. This corresponded with the peak in confidence in central bankers and paper money around the world. Remember when Alan Greenspan was revered globally for his seemingly flawless management of the U.S. economy? Well his reputation has taken a major hit and people are starting to open their eyes to the causes of this crisis. It's about damn time. There are two components to profiting in markets: 1) recognizing bull markets, and 2) holding on for dear life. 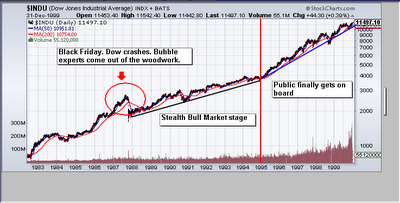 If you study the history of markets, you'll notice that the recognition of bull markets is rather slow. This stems from the fact that bull markets follow bear markets. Investors who have grown accustomed to sustained weakness in a given asset will regard all rallies as a countertrend rally in the context of a bear market. You are seeing this very same phenomenon play out in the stock market as we speak. I've already told you, stocks will ironically rise in this debt crisis. The holding on for dear life aspect of profiting from bull markets is made difficult by the inevitable monster corrections that have people convinced the bull market has concluded. 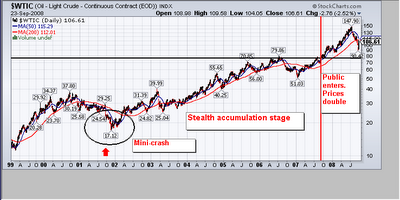 The smart money sees these corrections as buying opportunities; speculators see this as the end of the bull market. Who's right? Well the smart money is called the smart money for a reason. Below I've included charts from 3 different bull markets in 3 different assets: Stocks from 1982-2000; Crude oil from 1999 to 2008; and Gold from 2001 to the present. I've marked for you the respective periods of accumulation (bull market recognition) and the monster intermediate-term corrections (holding on for dear life). As we approach a truly critical juncture in the bull market in gold, all of you will have to decide whether to be an investor or a speculator. I suspect those of you who go the speculating route will regret it in 10 years. I've tried to drill it into all your heads that the hardest thing to do in this next leg up will be holding. I've laid out repeatedly why buying and holding is the best approach. Now let's see how many of you can execute.